IBM has made deploying ESXi within the IBM PureFlex Flex System environment a snap. 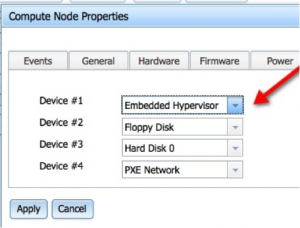 They’ve included VMware ESXi (5.1 at this time) on each and every X series compute node. Before we power it on, we need to adjust the boot order. To do this, click on the node that you’re wanting to configure, then on the Boot Sequence tab, select “Embedded Hypervisor” as Device #1. From there, power on the node from the Chassis Management screen. Now, log into your IBM Flex System V7000 Storage Array interface. 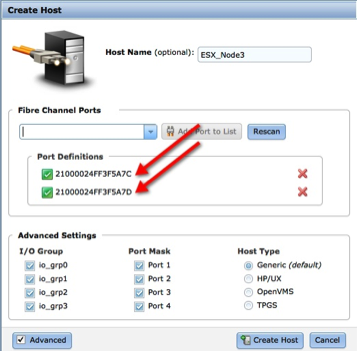 Select each HBA from the Fibre Channel Ports drop-down menu and click Add Port to List. Then click Create Host. You can now close the console and verify connectivity using ping. You can now manage your ESX server using the vSphere client. From here, add your datastore, configure networking, and you’re ready to go!